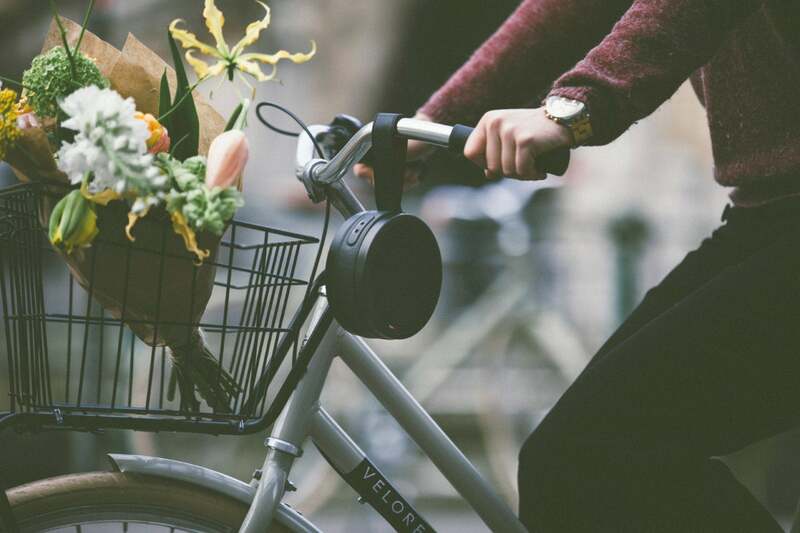 With its swinging name (Andiamo is Italian for “let’s go”) and Milan-school-of-fashion looks, Tivoli’s Audio’s first portable Bluetooth just begs to be taken places and shown off. This handsome device is bigger (5.3 inches wide by 2.2 inches high) and heavier (1.59 pounds) than such rival take-me-alongs as the Bose SoundLink Micro and the Ultimate Ears Roll 2. You can’t fit this puppy in your pants pocket, but it’s not much of a burden for a backpack or overnight bag. With more bulk comes more brawn, the opportunity for a significantly bigger sonic impression. I was able to crank a gritty new Jack White live performance of “Blunderbus” (exclusive to Amazon Music) to a walloping 110dB as measured by my trusty sound pressure level meter. Thanks go to the Andiamo’s relatively hefty driver—a 2.5-inch, up-firing full-range speaker powered by a 20-watt amplifier, supplemented by a 3-inch passive radiator resonating extra bass warmth through its sealed back. Tivoli Audio’s Andiamo puts out especially good vibes when plopped on a solid surface such as a granite countertop. There’s a 24-bit DSP (digital signal processor) onboard to contour the sound and reduce distortion, and the whole thing is powered by a 2,600mAH Lithium-ion rechargeable battery. Tivoli says you can expect up to 20 hours of playtime after a three-hour charge, but my audio adventures have lasted more like 11 or 12 hours. The Andiamo is packed into a round and sturdy aluminum enclosure, available in your choice of brushed silver or flat black. Design notes include an attractive patterned grill on top, and upscale stitched leather trim that’s functional as well as pretty. 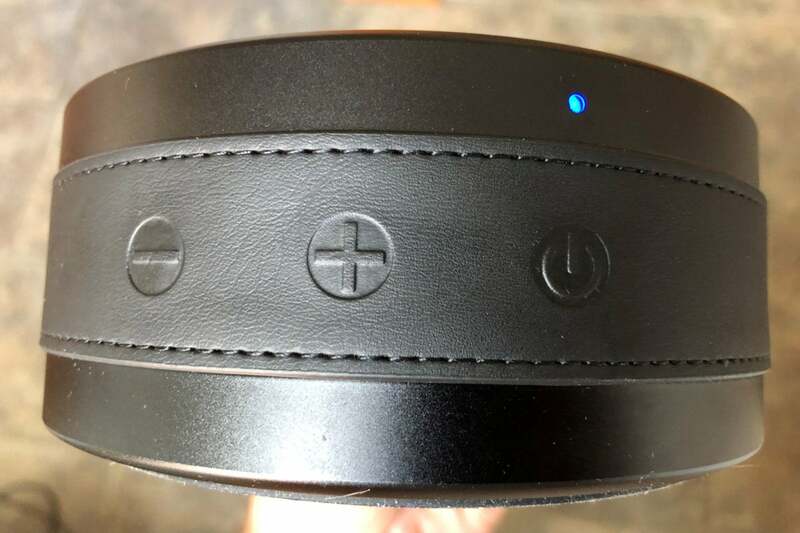 You press embossed spots (more easily felt than seen ) on the band to control volume, power, and Bluetooth pairing. You’ll also find a jack for the speaker’s AC adapter and a 3.5mm aux input here. The leather band is cinched at 12 O’clock to create a nicely sized loop handle for day tripping or hanging the thing from a tree branch or handlebar (see above). Honestly, it’s when and where you finally plop this speaker down that will shape your ultimate judgement of the Andiamo’s sonic caliber. There’s just a thin ring of rubber to separate its metallic back from whatever surface it’s sitting on when laid flat, leaving little material to prevent the vibration transfer. And that seems by design, as a whole lot of sonic energy is conducted from the speaker's back to the surface below. If the Andiamo is resting on, say, a lightweight pine Ikea kitchen table, some nasty rattling and resonant feedback will occur (whether or not the table is set for supper). Drop it on a bed and no problem—blankets and sheets nicely cushion and sedate the sound. But for the best and brightest results, place this speaker on a solid surface, such as a granite kitchen countertop. Now the music sharpens, toughens, and flies right, picking up in volume, clarity, and bass power. The granite effectively functions as a sounding board. The embossed buttons are easier to feel than see, but they’re simple enough to use once you’ve memorized their locations. Placed ideally so, this acoustic jazz freak couldn’t believe how boldly Paul Chambers’ signature bass line played through the Miles Davis classic “So What” (from Kind of Blue), and how sweet and sensual singer/bassist Esperanza Spaulding’s “Cinnamon Tree” swirled around the kitchen counter. 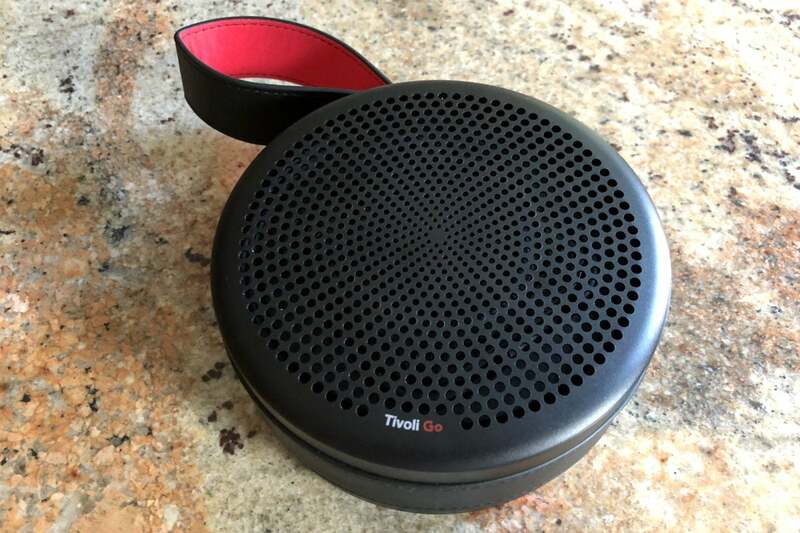 Unlike other outdoorsy-focused Bluetooth portable speakers, the Andiamo lacks any degree of weatherproofing, and it won’t function as a Bluetooth speakerphone—although music will pause when a call comes in to a connected phone. Curiously, you can’t use the volume buttons on your phone to control the speaker’s output, either. Tivoli doesn’t provide a dedicated app for the Andiamo, so I suggest cranking the Andiamo’s onboard volume control close to maximum and using the volume control—and any EQ settings—in whatever app you’re sourcing your music from. I also discovered a quirk where the Andiamo sometimes forgets its prior associations with my iPhone X or iPad Pro, forcing reconnection pokes on the speaker and device settings. Minor objections notwithstanding, I’ve found the Tivoli Andiamo a likeable home companion and travelmate. It’s one of those “not too small, not too big” compromises that fit a niche for toteability, robust performance, and easy-on-the-eyes appearance. It’s fun and easy to bring and share the music with the Tivoli Audio Andiamo, a portable speaker with good looks and sonic punch.